Chestnuts for Magosto.San Lucas in Mondoñedo. The American holiday that I miss the most is Thanksgiving. Of course Christmas holds a special place because of family, but I usually return to the United States during the Christmas holiday; it has been more than three years since I’ve indulged in turkey, stuffing, and pumpkin pie. Magosto, while not the same, comes close to satisfying my turkey cravings. The festival is mainly celebrated in Ourense and the surrounding villages in mid-November. Like most festivals in Galicia, Magosto has its origins in pagan rituals. Traditionally, Magosto occurred during the time of a family’s annual pig slaughter before winter. However, with changing climate, the traditional matanza of a pig is now done in December or even early January. 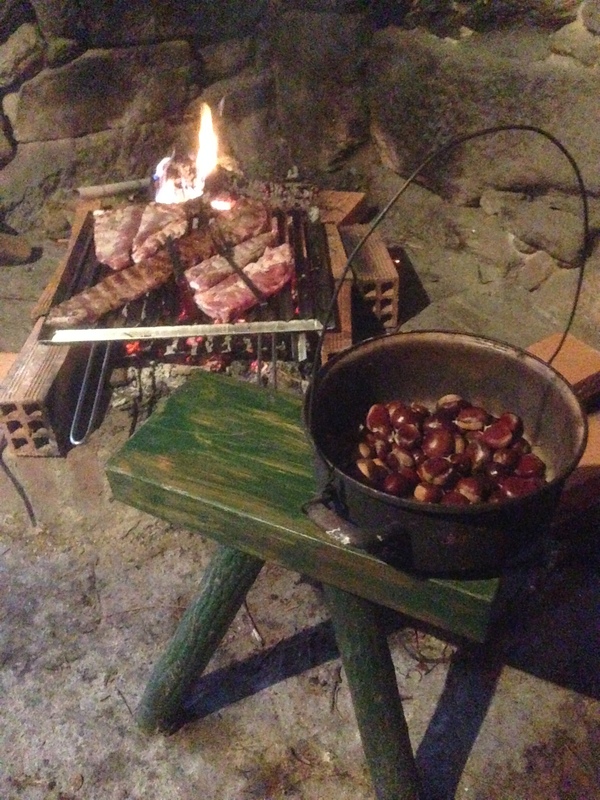 The Magosto tradition is to go to the hills that surround Ourense, collect kindling and chestnuts, make an open fire, and grill the chestnuts and chorizos and drink young red wine and licor café under the stars at night. Children “paint” their faces with the ashes from the fires. It is usually cold and rainy but people brave the conditions to keep the traditions alive. It has been a special occasion for me my Galician friends invites me to their homes to celebrate Magosto with chestnuts, chorizo, grilled meats, empanadas, cakes, desserts, wines, liqueurs, and more. Rio de Janeiro gets the global headlines, while Cádiz and Tenerife have the most widely known Carnaval celebrations in Spain. 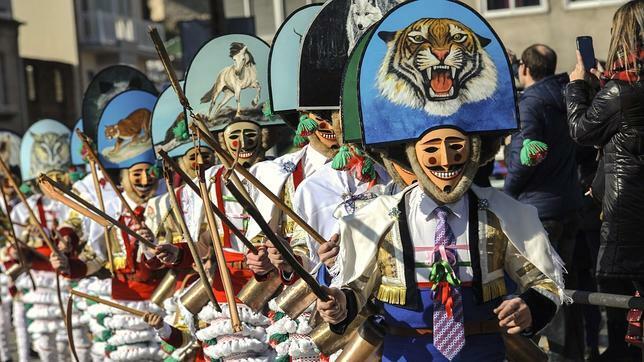 However, the unique Carnaval celebrations in Galicia–known as Entroido in the Galician language–gain more notoriety every year. Many communities in Galicia have their unique bent on the pre-Lent festivities, but the most popular and notorious are found in the magical Entroido Triangle: the villages of Xinzo, Laza, and Verín in Ourense province. Many villages throughout the province have traditional costumes unique to each village. In Xinzo, the pantallas enforce their authority in the streets. They run through the town making noises with cow bladders that have been dried and inflated. If they see a friend not wearing a costume, they force that person into a bar and make them pay a round of drinks for the pantallas. Laza is famous for its, let’s say, sadomasochist tradition on the Sunday before Ash Wednesday: ants are dipped in vinegar, making them extra angry, and then placed in bags of flour and soil and tossed at the throngs of revellers that fill the streets of the tiny mountain village. The smart party-goers wear goggles and other protection, while the brave–or brainless–endure the onslaught of biting insects with little clothing. The “cigarrón” becomes the authority in the village. Also known as the Feast Day of Saint James, Galicia celebrates its national holiday on 25 July. The holiday is also a national holiday in Spain as Saint James is the patron saint of the country. The main center of festivities is Santiago de Compostela, where the remains of the apostle have been reportedly venerated since their discovery in the 9th Century. There is an impressive fireworks display the evening before the holiday in Compostela and a visual display is projected onto the cathedral’s facade. The day of the festival is full of traditional dance and music groups filling the streets of old town Santiago, while there are also displays of Galician national pride and identity. Mondoñedo is a small village in the province of Lugo. Despite its size, it holds an important place in Galician history as one of the ancient seven provincial capitals and home to an impressive cathedral. Every October, the unique As San Lucas fair is held in the village. It is a rural, agricultural fair and the highlight is the bajada where hundreds of semi-wild horses are driven down the surrounding hillsides and right through the town center. It is quite a sight to see hundreds of horses galloping over the cobbled main square, past the moss-covered cathedral, and through the narrow streets. The following day awards are given for best-of-show for the quality of the horses. And, of course, plenty of typical Galician food is on display, from empanadas to grilled chorizos and meat. I love literature so I find it praiseworthy that Galicia celebrates a public holiday to honor their language and literary tradition. Each year, the Royal Galician Academy selects one Galician writer, who has been dead at least ten years–to dedicate the holiday, which has been held 17 May since 1963. This day is very important in Galician history, language, and literature, as it was the day in 1863 when Rosalía de Castro published her first collection of poetry. Rosalía’s defied societal norms to write in Spanish, choosing instead to write in Galician which was seen as a backwards language of the uneducated rural population. As a result, Rosalía is universally admired in Galicia and credited with sparking the Rexurdimento, the renaissance of Galician language and culture, in the 19th Century. Fittingly, Rosalía was the first Galician writer to be honored during the first Día das Letras Galegas in 1963. There are celebrations throughout Galicia and the year’s literary honoree is widely promoted and remembered. I like the Foliada, the spring festival when things are busting into life. San Caralampio in Melide is a blast, but strictly for locals and I’ve always wanted to go to San Andrés do Teixido. Thanks for the post! Interesting. Great blog, Seth. Thanks for share to the world my country and traditions. Congrats. I recommend you to go, at least, once in your life to San Andrés de Teixido 😉. Another incredible festival is “A rapa das bestas”. Again, great job. Thanks for share.